Crosby did not score a point in the Packers' Week 17 loss to the Lions and finished the regular season with 124 points over 16 games. Analysis: Crosby bounced back from the career-low 78 points he scored in 2017 with his highest point total since 2014. He made 81 percent of the field goals he attempted and bounced back nicely after missing five attempts -- including four in one game -- over his first five contests of the season. Crosby is under contract with the Packers for two more years, making him the favorite to remain the team's kicker in 2019. 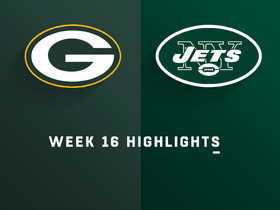 Crosby converted all three of his extra-point attempts and nailed field goals of 42, 29 and 38 yards during Sunday's 44-38 win over the Jets. Analysis: Some wanted to run Crosby out of town when he missed four field-goal attempts and an extra point against Week 17's opponent, the Lions, during a Week 5 loss. He's since converted all 26 of his extra-point attempts and 19 of 21 field-goal attempts, including nine from 40 yards out or farther. 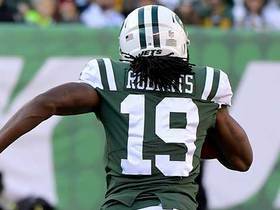 He seems back on track and will likely have some revenge on his mind in the finale against Detroit. Crosby made three field goals in Sunday's loss to the Bears. 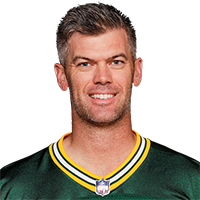 Analysis: The Packers went for two on the only touchdown they scored on the day, but Crosby still returned some value in Week 16 -- particularly for those that count field-goal distance -- hitting three field goals for the first time since Week 6, all between 40-49 yards. With 112 points through 14 games, Crosby is on pace to finish with his highest-scoring season since 2014. Crosby made two field goals and four extra points in Sunday's victory over the Falcons. Analysis: Crosby reached double digits in points for the first time since Week 6, and he provided an extra boost in leagues that count field-goal distance by connecting from both 50 and 48 yards. Crosby and the Packers will next square off against a Bears team that has allowed opposing kickers to attempt just 20 field goals and 21 extra points all season. Crosby was 1-for-2 on field-goal attempts and 2-for-2 on extra-point attempts in Sunday's loss the Cardinals. Analysis: Crosby made his first three kicks of the day, but he was wide right on his final attempt, a 49-yard field goal that would have tied the game at the final buzzer. 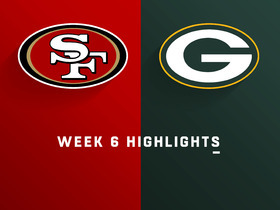 The Packers will next square off against a Falcons team that allowed opposing kickers to convert eight field goals and seven extra points over its last three games, but Crosby could have a tough time taking advantage, having made just seven total field goals since the Packers' Week 7 bye. Crosby made a 38-yard field goal and two extra points in Sunday's loss to the Vikings. Analysis: Crosby did not miss a kick for the fifth time in six weeks, but his scoring opportunities were minimal. He isn't doing much for fantasy owners of late, totaling just 23 points and not hitting a kick longer than 38 yards over the last four weeks. Crosby made a 36-yard field goal and three extra points in Thursday's 27-24 loss to the Seahawks. Analysis: Crosby's output would have gotten a boost had he converted a 47-yard field goal in the first quarter, but he instead missed for the first time since his Week 5 debacle. 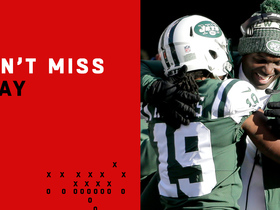 The kicker ultimately finished with a single-digit point total for the fourth game in a row. Crosby and the Packers will next square off Nov. 25 against the Vikings, a team he totaled a season-best 17 points against in Week 2. Crosby made a 38-yard field goal and four extra points in Sunday's victory over the Dolphins. 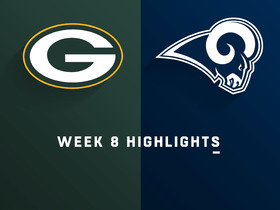 Analysis: The Packers excelled at converting red-zone trips into touchdowns in Week 10, which resulted in a season-high four extra-point attempts and limited him to one field-goal attempt for the second straight week. Field-goal attempts could be hard to come by again in Week 11, as the Packers will square off against a Seahawks squad that ceded just two field-goal attempts and one make over its last three games. Crosby made a 29-yard field goal and two extra points in Sunday's loss to the Patriots. Analysis: Crosby was perfect for the third straight week, but his opportunities were limited, and he finished with his second lowest point total of the season. Crosby's output has been a bit inconsistent this season, but he does have 70 points through eight games, which is just eight shy of the 78 he finished with last year, and puts him on pace to reach 140 points for the first time since 2013. 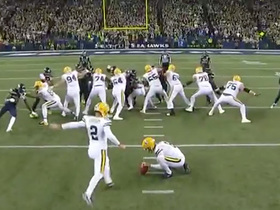 Green Bay Packers kicker Mason Crosby makes a 45-yard field goal attempt. 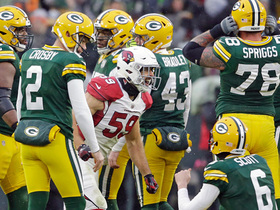 Green Bay Packers kicker Mason Crosby misses a 49-yard field goal attempt and the Arizona Cardinals win the game. 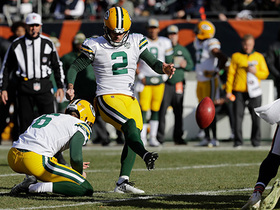 Green Bay Packers kicker Mason Crosby misses 47-yard field goal attempt. 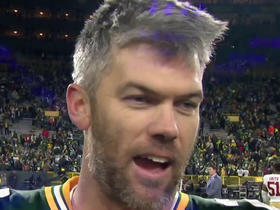 Green Bay Packers kicker Mason Crosby talks about hitting the game-winning field goal against the San Francisco 49ers on Monday Night Football.